Can a smartphone replace a quality camera? In our world, photography has not become as important and important as it was 20 years ago. So say people who in the past were professional photographers. Yes, the photo itself has not lost its relevance, it has become even more expressive accent for every person who prefers to spend his free time in social networks. But the importance of photography as an art is no longer so important, because today everyone can take an instant photo and see how it will look on the screen of a smartphone or on the screen of your camera. The reason for this sharp accent is that you do not even need to understand how the camera works, how the image is formed, and you do not need to know such things as exposure, sensitivity, exposure, aperture, and even such basic knowledge is not required, as an objective. The reasons for this evolution are the development of information technologies, both in the field of computerization and in the field of photographic equipment. For a short period of time, the photo quickly ceased to be analog, for which really great knowledge was required to make a high-quality picture, and became known as digital. The whole role of human knowledge was assumed by the processor and the matrix, processing images. A person just needs to touch the screen of a smartphone or press a button on his camera. And for a split second you will get amazing pictures. At this point in time, almost no one will have questions, which is more convenient to photograph. Naturally, for this purpose people began to use smartphones, as they allow you to quickly take a photo and instantly share it with what they think is necessary. However, for example, on the beaches, still there are often people who have large cameras with them, and which they use to create a photo. And such people use high-quality cameras, not smartphones, to get a really excellent image quality. The whole reason lies in the fact that SLR cameras have a large matrix, they have excellent low-dispersion glasses in lenses, which is a consequence of high-quality photography, which is more important for many people than a quick opportunity to simply share with their familiar people. However, gradually with each new generation of people, the quality of photography departs to a secondary plan, as people have already stopped looking at new photos on the computer or on the TV and use their smartphone for this opportunity. Every year, and technology is developing. This suggests that in the near future, perhaps large cameras and generally will go to dignity in peace. For this, all prejudices already exist. 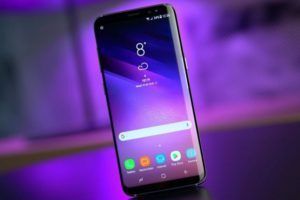 Just look at the flagship smartphone from Samsung – Galaxy S9 | S9 +, which really impresses with its compositions and masterpieces. The new smartphone from the South Korean company is equipped with not just two main cameras, which even before this model performed fairly high-quality images. The new smartphone has a variable aperture with values ​​of F 2.4 and 1.5, which will allow you to make stunning photos regardless of lighting conditions. Most smartphones can not boast that their picture quality will look the same as on a summer day, with sufficient light. However, this does not concern the new S9 model at all. Thanks to a very powerful processor and graphics subsystem, as well as revolutionary software, the smartphone independently selects the right aperture value to get an excellent shot. At the same time, at the moment of executing the photo, he creates several photos and imposes them on each other, then to create a single file that the user sees. Now no matter where you are, in a dark nightclub, creating a portrait photo on a sunset background or just wanting something to take off at once, the new flagship will allow you to do it in such a way that it will be difficult to distinguish from a professional camera. Therefore, the top-end smartphone is very soon completely replaced by professional cameras.